The universe does not believe in Christmas, though this photo of a stellar nursery called NGC 346 might remind you of a seasonal decoration. It’s actually a combination of images: NASA’s Spitzer Space Telescope provided the infrared, the ESO’s New Technology Telescope added the visible light spectrum, and the European Space Agency’s XMM-Newton spacecraft sent in the x-ray. Clusters like these, dating back to just a few billion years after the Big Bang, are the source material for scientists looking to understand star formation, and by combining data from several telescopes they gain a better understanding on the goings-on at these nurseries. Two’s the charm: You’re looking at a white dwarf and a red giant, a binary star called R Aquarii. As they orbit, material gets sucked from one star to the other, creating these tendrils of gas and dust. The European Southern Observatory’s Very Large Telescope has a new instrument called SPHERE (short for Spectro-Polarimetric High-Contrast Exoplanet Research), and it’s primarily for hunting planets, but it ran a system test on this stellar pair. More R Aquarii from the ESO’s Very Large Telescope, this time from 2012, with rather different details visible on the nebula surrounding the pair. While the white dwarf hoovers material from its partner, the red giant spews out loops that can be seen here in red. So the stars’ relationship isn’t exactly mutual. Like George and Martha from Who’s Afraid of Virginia Woolf, this couple may seem charming, but don’t let that fool you. Zooming out quite a bit, let’s take a distant view of R Aquarii courtesy of the ESO’s Digitized Sky Survey 2. The pair of stars can be seen right at the center of the image as a bright orange dot. 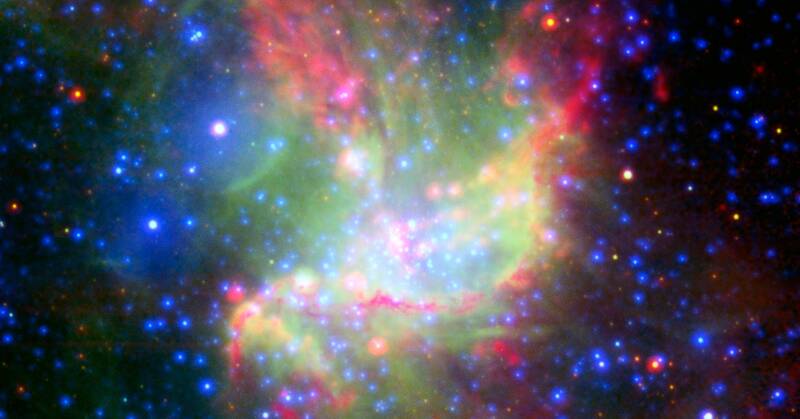 Even at this remove, you might notice the red loops of gas jutting out from the sides of the stars. Cut loose, Speculoos: In the clear-skied Atacama desert of Chile, ESO astronomers built a prototype telescope to search for Earth-sized, potentially habitable planets orbiting smaller stars. For its starter snap, Speculoos appears to have done a splendid job with M83, otherwise known as the Southern Pinwheel galaxy, a bright barred spiral about 15 million light years away. Jupiter’s coming atcha! This photo series comes from Juno last April—April Fools’ Day, to be exact. The changing angle in each image offers a sense of the spacecraft’s trajectory as it flew past the planet. There’s the bright, famous, always-be-photobombing Great Red Spot, but the white, gray, and brown undulating clouds that encircle the gas giant are mesmerizing in their own right.